DNA mutations happen when there are changes in the nucleotide sequence that makes up the strand of DNA. This can be caused by random mistakes in DNA replication or even an environmental influence like UV rays or chemicals. The changes at the nucleotide level then influence the transcription and translation from gene to protein expression. Changing even just one nitrogen base in a sequence can change the amino acid that is expressed by that DNA codon which can lead to a completely different protein being expressed. These mutations range from being non-harmful all the way up to causing death. 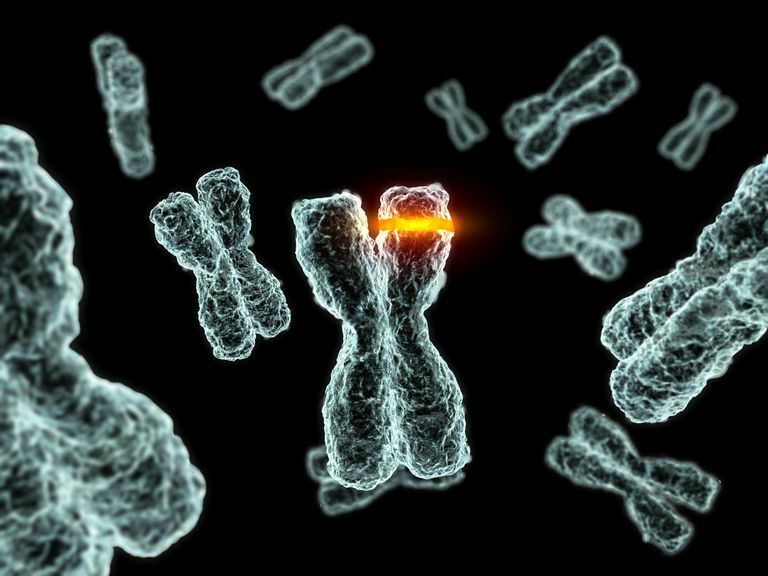 A point mutation is usually the least harmful of the types of DNA mutations. It is the change of a single nitrogen base in a DNA sequence. Depending on the placement of that nitrogen base in the codon, it can cause no effect to the protein. Codons are a sequence of three nitrogen bases in a row that is "read" by messenger RNA during transcription and then that messenger RNA codon is translated into an amino acid that goes on to make a protein that will be expressed by the organism. Since there are only 20 amino acids and a total of 64 possible combinations of codons, some amino acids are coded for by more than one codon. Often, if the third nitrogen base in the codon is changed, it will not change the amino acid. This is called the wobble effect. If the point mutation occurs in the third nitrogen base in a codon, then it causes no effect on the amino acid or subsequent protein and the mutation does not change the organism. At most, a point mutation will cause a single amino acid in a protein to change. While this usually is not a deadly mutation, it can cause issues with that protein's folding pattern and the tertiary and quaternary structures of the protein. One example of a point mutation is sickle cell anemia. A point mutation caused a single nitrogen base in a codon for one amino acid in the protein called glutamic acid to instead code for the amino acid valine. This single small change causes a normally round red blood cell to instead be sickle-shaped. Frameshift mutations are much more serious and deadly than point mutations. Even though only one nitrogen base is affected just like in point mutations, this time the single base is either completely deleted or an extra one is inserted into the middle of a DNA sequence. This change in sequence causes the reading frame to shift, hence the name frameshift mutation. A reading frame shift changes the three letter long codon sequence for messenger RNA to transcribe and translate. Not only is that amino acid changed, all subsequent amino acids are changed. This significantly changes the protein and can cause severe problems and even possibly death. One type of frameshift mutation is called an insertion. Just as the name implies, an insertion occurs when a single nitrogen base is accidentally added in the middle of the sequence. This throws off the reading frame of the DNA and the wrong amino acid is translated. It also pushes the entire sequence down by one letter, changing all codons that come after the insertion and therefore completely altering the protein. Even though inserting a nitrogen base makes the overall sequence longer, that does not necessarily mean the amino acid chain length will increase. In fact, it could seriously shorten the amino acid chain. If the insertion causes a shift in the codons to create a stop signal, a protein may never be made. Otherwise, an incorrect protein will be made. If the protein that has been changed was essential for life, then most likely the organism will die. The other type of frameshift mutation is called a deletion. This happens when a nitrogen base is taken out of the sequence. Again, this causes the entire reading frame to change. It changes the codon and will also affect all amino acids that are coded for after the deletion. Nonsense and stop codons may also appear in the wrong places, much like an insertion. Much like reading text, the DNA sequence is "read" by messenger RNA to produce a "story" or an amino acid chain that will be used to make a protein. Since each codon is 3 letters long, let's see what happens when a "mutation" occurs in a sentence that uses only three letter words. THE RED CAT ATE THE RAT. THC RED CAT ATE THE RAT. The "e" in the word "the" mutated into the letter "c". While the first word in the sentence is no longer the same, the rest of the words still make sense and are what they are supposed to be. THE CRE DCA TAT ETH ERA T.
The insertion of the letter "c" after the word "the" completely changes the rest of the sentence. Not only is the second word no longer readable, neither are any words after it. The entire sentence has changed into nonsense. THE EDC ATA TET HER AT. In the example above, the "r" that should have come after the word "the" has been deleted. Again, it changes the entire sentence. Even though in this example, some of the subsequent words are readable, the meaning of the sentence has completely changed. This shows that even if codons are changed into something that isn't nonsense, it still completely changes the protein into something that is no longer functional.